I know on taking this original photo, it was a special moment, unscheduled, unannounced, just captured at the right time, with all natural light, just at low level sunset. Today’s challenge: the Golden eDition, using the fabulous texture ‘golden’ from Kim Klassen, and then tweaking your photo with as much addition or subtraction you desire. Kim Klassens ‘golden’ texture + Kim Klassens ‘notooshabby’ texture + film grain 50% + saturated tint 40% + adjustments on light+ highlights + shadows. I love the paper crisp texture of the foliage and how they almost look transparent and the golden corn kernels. WOW Yvette, that looks awesome! That corn is reminiscent of something long ago! 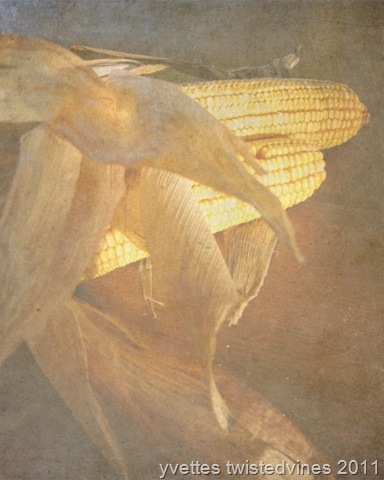 H, Yvette, the photo is lovely…the husks of the corn look very fluid and poetic..like veils flowing in the wind. Beautiful processing. I like the almost translucent corn husks and the way the light hits them. Nice photo, unusual motiv, I think, very fine.